Over 80 community members participated in a community visioning process called “Our Green Villages” which helped establish Sustainable Woodstock in 2009. Over the last few months, proposals to convene a new community visioning process have been floated by different people in several groups and organizations. Now we are working to bring these ideas together and design an actual project. “Community visioning” refers to a process of gathering all interested citizens and stakeholders to take stock of a community’s resources, challenges, and aspirations, and to work collaboratively to establish common goals. It is a way of imagining the future we want for ourselves, our families and neighbors, and deciding on collective actions that could make that future more likely. Professor Keeton has been studying some of the older stands at the park because he is interested in the old-growth forest characteristics that exist in these stands. Because Vermont was almost completely cleared of trees in the 1800s, many of the forests that have grown up since then are still considered fairly young by forestry standards. However, there are some woodlands exhibiting what Professor Keeton called “old growth characteristics.” Marsh-Billings-Rockefeller National Historical Park happens to have some of the oldest stands in the state. Woodstock engaged in such a project back in 2005, facilitated by the Vermont Council on Rural Development (VCRD). 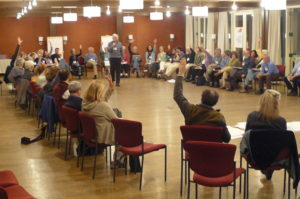 A series of public forums produced a list of needs and goals that included development of the East End, a more specific community identity, a commitment to attracting younger residents by nurturing a “creative economy,” more affordable housing, better police coverage, nature conservation and trail construction, coordination of area nonprofits, and exploration of a merger between town and village government, among others. A copy of the final report is available on the VCRD website at vtrural.org/programs/community-visits/reports/woodstock. Now, thirteen years later, some of these needs have been addressed, at least partially, while others remain unmet. Many of us think this is a good time to revisit the list to see what still needs to be achieved and what new goals we might establish in light of present conditions. Community visioning builds long-term resilience by getting more people involved in collaborative decisions. Diverse voices come to the table and all are heard. Everyone has a stake in planning for a desirable future, and citizens gain skills and confidence in working together to meet whatever challenges may arise. A community guided by an ethos that holds “we’re all in this together” is much stronger in the long run. The process has the potential to establish new efforts or institutions that benefit the community over the long haul. Once we identify common needs and challenges, we can devise strategies to address them. Both Sustainable Woodstock and the Economic Development Commission, for instance, were established because of momentum generated by the 2005 visioning project. The idea is currently in its very early stages. Those who become involved in organizing the project will need to make some basic choices, including selecting a group or individual to facilitate it. VCRD offers a community visioning follow-up program, which we might consider. Woodstock filmmaker Anne Macksoud has shown some of us a documentary she made several years ago about a very effective visioning project in a mid-sized city, facilitated by a team of professionals who specialize in this work. There could be other ways to approach the endeavor as well. The first step will be to bring together those people who want to help organize this project. We have been spreading the word to likely candidates over the last couple weeks, and will soon establish a date for a first meeting. Any reader who wants to get involved should contact me at 802-310-2169 or by email at rmiller9@sover.net. Watch this column and other news sources for updates as the process develops. And by all means, plan to participate when public forums are scheduled, which hopefully will be before the end of the year. Do Just One Thing: Participate in the upcoming community visioning process.